How Do Close-Coupled Pulpers Work? Foodservice waste enters the pulper and is mixed with water to create a pulpable slurry comprised of approximately 95% liquid and 5% solids. The slurry is transported through a short pipeline to the closely attached Hydra-Extractor. The Hydra-Extractor removes most of the water and the semi-dry pulp is discharged into a container for disposal. The extracted water is recovered and returned to the pulping tank for re-use, offering significant water saving. 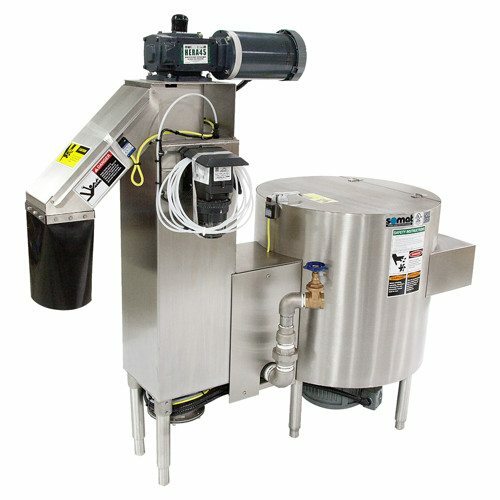 System is comprised of a pulper and Hydra-Extractor® integrated into one unit. Able to reduce waste volume by 8 to 1 (87.5%). Processes a wide variety waste types including compostable waste such as food, compostable disposables, cardboard and certain paper types, as well as non-compostable waste including plastics, milk cartons, polystyrene disposables and aluminum foil. Capacity of processing up to 1250 pounds of waste per hour. Available in several sizes and configurations including under dish table and tray feed models. Offers water savings by efficiently reusing extracted water. Available with The Grabber system to remove flatware and other ferrous metals from the pulping process.